March 5 (UPI) — Primary season gets underway Tuesday as Texans head to the polls, potentially signaling the fate of Democrats seeking to take control of Congress in November. One Senate seat and 36 House seats are up for grabs in the traditionally conservative state, but pollsters are keeping their eyes on a few districts that could flip blue, something the Democratic National Committee is hoping will happen enough times across the country to regain control of Congress. Republicans control the Senate (51-47 with two independents) and the House (238-193). In order for Democrats to take the majority, they’d need a net gain of two seats in the Senate and 24 in the House. Since the Civil War, the president’s party has lost an average of 40 House seats in midterm elections that took place while the president’s approval rating was below 50 percent, The Wall Street Journal reported, citing Cook Political Report. RealClear Politics’ average of polls shows President Donald Trump has a 40.2 percent approval rating as of Monday. Democrats already have seen some gains since Trump’s election in November 2016. Doug Jones was elected to fill Jeff Sessions’ Senate seat in Alabama which he left to become attorney general. And NPR reported about three dozen state legislature seats have had a partisan switch in favor of Democrats. Still, Tuesday’s primaries, particularly voter turnout, could be an indicator of what both parties can expect come Nov. 6. More Democrats showed up at the polls than Republicans in early voting in Texas from Feb. 20-27, a departure from previous election years. More than 250,000 Democrats voted early in the state, more than early voting in 2016, when a presidential election usually boosts participation. Lower voter turnout historically favors Republicans, so this boost in Texas, should it be repeated in November across the country, could be a boon for Democrats. One race on Democrats’ radar in Texas is the 23rd Congressional District, where five Democrats are on the ballot, each hoping to face off against incumbent Rep. Will Hurd in November. Hurd narrowly won re-election in 2016 by 1.3 percent in a district that voted for Democrat Hillary Clinton by 4 points the same year. Hurd has the financial advantage in Texas, though, raising $1.3 million as of Federal Elections Commission reports filed in October. His nearest Democratic competitors in terms of cash are Gina Ortiz Jones, who reported nearly $600,000, and Jay Hulings, who reported nearly $500,000, each as of February. Democrats also are looking to flip traditionally red Senate seats in Arizona (primary held Aug. 28) and Nevada (primary held June 12). Moderate Democrat Kirsten Sinema could snap up a seat left vacant by Sen. Jeff Flake, R-Ariz. Head-to-head polling in October between Sinema and a leading Republican contender, Kelli Ward, gives Sinema the advantage. Trump won the state in 2016. Democrats may have an easier time in Nevada, where incumbent Sen. Dean Heller faces a battle in both the primary and general election. The Democratic Senatorial Campaign Committee has backed U.S. Rep. Jacky Rosen to run for the seat, though she faces two others in the primary. A head-to-head poll in June gave Rosen the advantage over Heller. Nevada is the only red Senate seat up for grabs that Clinton won in 2016. But it’s not just Democrats who have plans to change the colors on the map come November. Sen. Bill Nelson, D-Fla., is the only Democrat elected to a statewide office in Florida, leaving him vulnerable to Republican Gov. Rick Scott, who many expect to challenge the senator. Quinnipiac University Poll gave Nelson a 4-point lead over Scott in late February. “The race is close, but Nelson’s double-digit lead with independents puts him in slightly better shape eight months from Election Day. This election is likely to be decided by turnout,” said Peter Brown, assistant director of the poll. A Florida Atlantic University poll in early February gave Scott the advantage. The state voted for Trump by a margin of 1.2 percent. 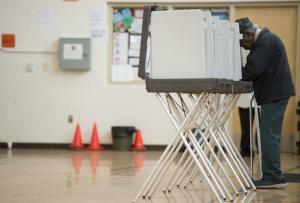 Florida primaries are scheduled for Aug. 28. Wisconsin could also shift red as incumbent Sen. Tammy Baldwin’s favorability slips to 37 percent compared to a 39 percent unfavorable rating as of Marquette Law School’s Monday poll. CNBC reported that among Democrats, Baldwin has the most money being spent against her. She’s running unopposed in the primary (Aug. 14), but four Republicans seek to oust her in November. Republican frontrunner Kevin Nicholson, a Marine Corps veteran, has the financial backing of billionaire Richard Uihlein and the Solutions for Wisconsin PAC. Nicholson has raised more than $400,000 to Baldwin’s $8.7 million as of Sept. 30. Baldwin won in 2012 with a 5.6 percent margin, and Trump won in 2016 by 0.77 percent. In the House, Republicans hope to snag the 8th Congressional District in Minnesota, where Rep. Rick Nolan said he would not seek re-election. He narrowly won re-election in 2016 by 0.6 percent and Clinton won the state by a 1.5 percent margin. St. Louis County Commissioner Pete Stauber, a Republican, outraged Nolan in the third quarter of 2017 before Nolan announced his retirement, and Politico reported the state’s districts have been turning away from Democrats since 2016. The state’s primary is scheduled for Aug. 14.